As I close my eyes ans drift away to a land where there is love, health, peace, and blessings. I wanted to take the time to think and reflect. Once again the desire - my previous thoughts. I was thinking about the investor and the idea of change. Or in my words, continuous improvement. Change or continuous improvement is actually a tough decision for investors, because there is a certain amount of risk, vs. return that we have to think about. What are the risks of implementing or subtracting a certain measure? These thoughts are a reflection of individual investors, small companies, or even large scale corporations. We have to do a risk analysis. But then what about the economy on a larger scale? What about the markets? The markets are also dependent upon the investor. However, they also face the uncertainty that is driven through the events of the world. The global economy can be compared to that of the world wide web. It is so intricately related. Maybe, the person who does not have a keen interest in the markets does not know this. Yet, everyone has a stake when it comes down to the Global economy. A disruption may not immediately effect the consumer, it will be likely to follow. A classic example of this is the Brexit decision. The value of the pound sterling has significantly dropped. The effects have had an impact upon people who will loose their jobs, as well as a shrinking economy. However, there was also an opportunity here for the investor, to begin to invest into Britain, and tap into markets where there are consumer demands. Yet, there is also the risk that comes along with the unknown and uncertainty. In the same sense we can think about the cause of humanity. When leaders begin to implement a new policy, or begin trade with other countries, there is a certain amount of risk. There is also a certain amount of return. We can think about this though through the following diagram. 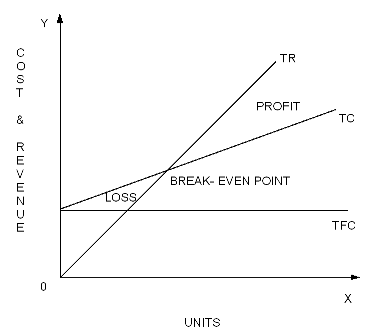 There will be a point where we accrue loss, and there will be a point where there is profit earned. Where the two points cross. This is called the break - even point. Similar to the investor who desires to build a company. The Governmental policy can be assimilated to that of a company. There will be risk. There will be returns. There will be a time that the reaping of the reward will not be seen, because of the time it takes for implementation. This is not to say that the desire for improvements cannot be achieved. The achievements take time and do not happen at the singular level, maybe initially. Nothing can really happen well without the development of good relationships. We have to build these relationships of trust, an alignment. To be able to foresee a vision at the level of the collective. This is what all great visionaries had in common. It was not the fact that they were, or are very affluent to begin with. It was their faith. The belief that they had in their vision. And it was also the ability to communicate this vision to others effectively. Dedication: These words are dedicated to all beings. Let us work together to build a hope, to develop the vision of peace, and prosperity for all beings. Great visions may begin with the select few, but evolve and shape through the loyalty of the vision, at the level of communal.